WASHINGTON, DC -- Russia is ready to address Kiev's concerns over gas prices and discuss its proposals, President Dmitry Medvedev said on Tuesday. 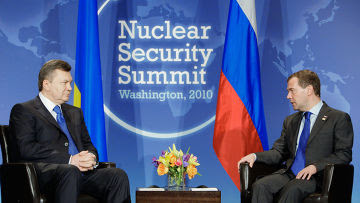 Ukraine President Yanukovych (L) meeting with his Russian counterpart Medvedev, in Washington, DC. "We will discuss the gas issue without fail. It is a topic that is really very important for Ukraine," he said during his meeting with his Ukrainian counterpart Viktor Yanukovych in Washington. He said discussions should be held by the countries' relevant ministries and government agencies. Medvedev's remarks followed Yanukovych's comments to the effect that he had yet to receive from the Russian president "a reply concerning gas price compensation." Ukraine's national energy company Naftogaz and Russian energy giant Gazprom agreed last week to increase natural gas deliveries to Ukraine this year from 33.75 bcm to 36.5 bcm. Gazprom said the increase would also help ensure reliable gas transit to European consumers next winter. Kiev has been pressing Moscow for months to reduce contracted gas volumes and in November 2009, Naftogaz and Gazprom agreed to reduce 2010 deliveries to 33.75 bcm. Yanukovych, who was inaugurated in February, vowed during his campaign to improve relations with Russia and renegotiate the January 2009 deal on gas supplies. Prime Minister Mykola Azarov previously told a Cabinet meeting he was confident a deal with Russia on lower prices would be reached soon. In March, Azarov met in Moscow with Miller, who said that gas prices would depend on volumes purchased from Gazprom. Azarov said after the meeting that Ukraine would buy as much gas as necessary for winter storage, but did not need excessive amounts of gas.